The favorites, the Cinderellas and the teams to avoid when filling out your bracket. The early release of the women’s NCAA Tournament bracket on Monday afternoon actually did fans a favor: If any year merits having additional time to fill out a bracket, this year is it. Three different teams were ranked No. 1 in the Associated Press poll this season, and a storyline has been how open the competition was for the top spots in each region. ESPN’s Mechelle Voepel wrote on Monday night that this year’s NCAA Tournament “might be as wide open as any since 2006,” with as many as seven teams that could legitimately cut down the net on April 7. Luckily, FiveThirtyEight’s March Madness prediction model is here to guide you as you make your picks. You can read about how the model works here or keep reading to learn what the model predicts for the top seeds, which teams could make an unexpected run and which squads could bow out sooner than expected. We’re also highlighting the best first-round matchups to help you schedule your Friday and Saturday around women’s hoops. The four No. 1 seeds are Baylor, Notre Dame, Louisville and Mississippi State. You read that right: UConn is not a top seed for the first time since 2006. But the Huskies are still a No. 2 seed, and they still got a regional nearby, in Albany, New York. The Huskies will host the first two rounds in Storrs, and their fans have packed Albany regionals for years — so they would essentially have home-court advantage until the Final Four. That’s a tough setup for the region’s No. 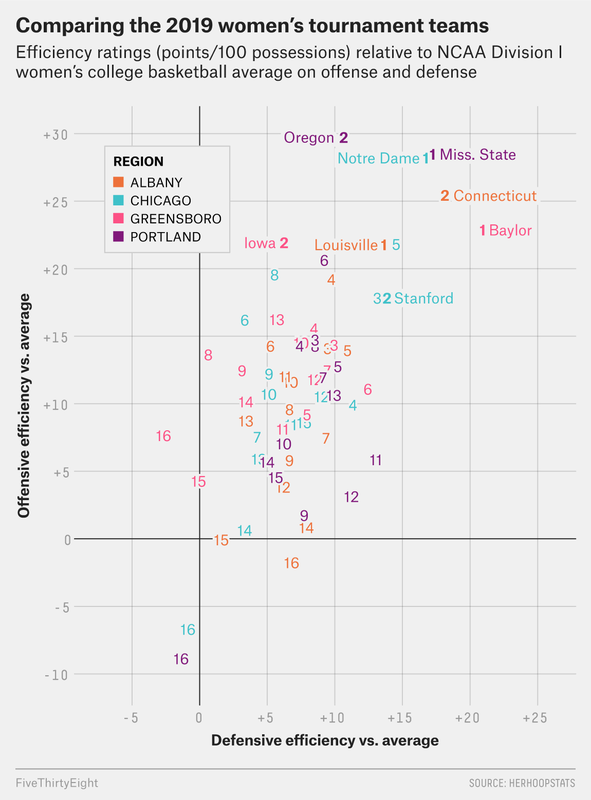 1 seed, Louisville, and the FiveThirtyEight model reflects that, giving UConn a 68 percent chance and Louisville a 24 percent chance of making the Final Four. But the Cardinals did beat UConn in January, as star guard Asia Durr scored a game-high 24 points. That win should give Louisville confidence as it chases its second straight Final Four appearance. The selection committee created a similar setup out west, where Mississippi State is the No. 1 seed and Oregon is the No. 2. With each team hosting the first two rounds and the regional rounds being played in Portland, Oregon could make its first Final Four without leaving the state. The model gives the Ducks a 51 percent chance of doing just that behind triple-double queen Sabrina Ionescu, who could be the first pick in the WNBA draft if she declares. Mississippi State, which secured its No. 1 seed after winning its first-ever SEC tournament title, has a 44 percent chance of making the Final Four and a 10 percent chance of winning a national title. The latter would be a storybook ending for the national runners-up in each of the past two seasons. The Greensboro, North Carolina, region is a hotbed of low-post talent, starting with the No. 1 overall seed in Baylor. The Lady Bears have had a dominant season to date, running their record to 31-1 and leading the nation in blocked shots, defensive rebounds and opponent field-goal percentage. The 6-foot-7 Kalani Brown and 6-foot-4 Lauren Cox have combined to average more than 28 points, 16 rebounds and 4 blocks per game. Not to be outdone, No. 2 seed Iowa has espnW’s national player of the year in 6-foot-3 Megan Gustafson. According to Her Hoop Stats, Gustafson is both the nation’s top scorer, putting up 28.0 points per game, and the nation’s most efficient scorer, recording 1.44 points per scoring attempt and shooting just under 70 percent from the field. There are several low-post standouts among the lower-seeded teams as well, but Baylor projects to be the best in Greensboro, with a 76 percent chance of making the Final Four. Although Baylor is the No. 1 overall seed, it’s the top seed in the Chicago region, Notre Dame, that has the best chance of winning a national championship. The FiveThirtyEight model gives the defending champs a 30 percent chance of repeating and Baylor a 28 percent chance at its first title since 2012. The Fighting Irish returned all but one starter from last year’s team and then led the country in points per game while playing the nation’s toughest schedule. Notre Dame’s chief competition in Chicago will likely be No. 2 seed Stanford, the Pac-12 tournament champions and the only team to beat Baylor this season. Under head coach Tara VanDerveer, the Cardinal have a 56 percent chance to make the Elite Eight but just an 8 percent chance to advance to the Final Four. A pair of 4-seeds could knock off some of the favorites in the Sweet 16. In Albany, Oregon State has a 21 percent chance of making the Elite Eight, potentially displacing Louisville, while South Carolina has a 10 percent chance of doing the same to Baylor in Greensboro. Oregon State finished third in what was perhaps the nation’s deepest conference, the Pac-12, and ranks fourth in the nation in 3-point shooting at 38.8 percent. If the Beavers, particularly star guard Destiny Slocum, get hot from deep, they could extend their stay on the East Coast to the Final Four. Under head coach and former Virginia point guard Dawn Staley, South Carolina also has electric guard play, which could set up a fascinating game of contrasts against Baylor in the Sweet 16. Don’t count Staley out as she chases her second national championship in the past three seasons. Also in the Greensboro region, No. 3 North Carolina State has received relatively little attention compared with ACC rivals Louisville and Notre Dame despite starting the season 21-0. (NC State didn’t lose a game until February!) The Wolfpack would not have to leave their home state to make the Final Four, and the FiveThirtyEight model gives the team almost the same chances as No. 2 seed Iowa of advancing to the Elite Eight (40 percent versus 42 percent). It’s perhaps a sign of progress that a mid-major team can even be considered for this category, but Gonzaga, the No. 5 seed in the Albany region, probably won’t see it that way if this prediction proves true. Gonzaga is vulnerable after two players suffered season-ending leg injuries in its conference tournament semifinal. The model still gives the Bulldogs an 87 percent chance of beating Arkansas-Little Rock, but a team that was ranked in the top 25 for parts of this season and had aspirations of hosting the first two rounds as a top-4 seed surely has its sights set higher than one NCAA Tournament win. No. 4 Texas A&M has also had injury concerns, although the school recently announced that leading scorer Chennedy Carter (22.5 points per game) will play in the NCAA Tournament. She is returning from a hand injury, though, and if her shot isn’t falling, Texas A&M could struggle with a tough Wright State team that holds opponents to just 36.2 percent shooting, which ranks 24th in the nation. Speaking of tough mid-major teams, the state of Florida has a couple that will start the NCAA Tournament in Miami. No. 5 seed Arizona State can’t be happy about traveling all the way across the country to play No. 12-seed UCF in their backyard, and the Sun Devils have only a 69 percent chance of winning one game and a 26 percent chance of winning two games in the Sunshine State. Meanwhile, host and No. 4 seed Miami has an 82 percent chance of beating No. 13 seed Florida Gulf Coast, but there are signs of a potential upset here. FGCU is ranked only three spots behind Miami in the Her Hoop Stats ratings (the teams rank 28th and 25th, respectively) and is dangerous behind the arc: Nearly half of FGCU’s shot attempts are 3-pointers, which ranks second nationally, while Miami is letting teams score more than one-third of their points from three, which ranks 320th nationally. If you’re looking for two senior stars trying to extend their careers, watch No. 8 seed California take on No. 9 seed North Carolina on Saturday at 3:30 p.m. Eastern time. Kristine Anigwe has had a historic season for the Golden Bears and leads the nation in rebounding with 16.3 per game, including a 32-point, 30-rebound effort against Washington State two weeks ago. North Carolina ranks in the bottom third of teams nationally in rebounding rate, so one might predict a long afternoon for the Tar Heels, but their offensive firepower can keep them in any game. (Just ask Notre Dame and NC State, which both lost to North Carolina in the span of a week earlier this year.) Guard Paris Kea is the star (17.1 points per game), but three other players average double-figure scoring and a fourth averages 9.5 points per game. If you’re looking for a battle between mid-major powerhouses, don’t miss No. 6 seed South Dakota State versus No. 11 seed Quinnipiac on Saturday at 11 a.m. Eastern time. Both teams have been to the tournament before: SDSU won its ninth automatic bid in 11 years this season, while QU is in for the fifth time in seven seasons and made a Sweet 16 appearance in 2017. SDSU boasts the Summit League’s all-time leading scorer in Macy Miller, who is averaging 18.1 points per game this season while shooting nearly 55 percent from the floor. But Quinnipiac could make things tough for Miller and the Jackrabbits: The Bobcats hold opponents to just 50.5 points per game, second-best in the nation, and their 11.5 steals per game rank sixth nationally. Whichever way this game goes, the winner could be a sleeper pick to knock off No. 3 Syracuse and make the Sweet 16.